Elvis Presley's iconic song ‘Heartbreak Hotel’ was recorded on January 10, 1956. In the session was featured his band at the time, The Blue Moon Boys, which included guitarist Chet Atkins and pianist Floyd Cramer. 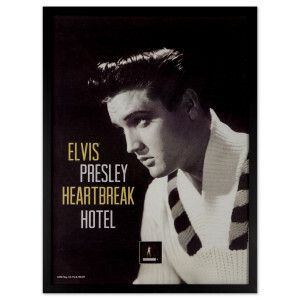 Rolling Stone magazine named ‘Heartbreak Hotel’ one of the "500 Hundred Greatest Songs of All Time". This beautiful photo of Elvis from the LP jacket with a stamp of related design has been faithfully reproduced by the Imperial Mint. The stamp and image are professionally matted and enhanced by an 18x24" wood frame. The stamp is non-circulated from its country of origin and sought after by collectors around the world. It will appreciate in value for years to come. If you are a fan of the "King" and want to be transported back to the beginning of Rock and Roll, this Imperial Mint work of art will evoke memories of music that never dies. This Imperial Mint artwork carries a Certificate of Authenticity for the stamp.